Gabrielle Hamilton’s Layer Cake: Cooking, Writing, KidsShe wants to “know” her kids. An Update on Gabrielle Hamilton’s Latest AffairsHer ready-to-cook shop is still just a dream. 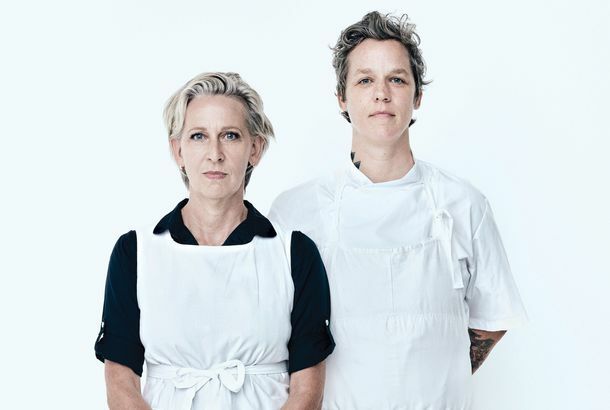 Amidst Rumored Scandal, NYC Chef Gabrielle Hamilton Comes to TownPage Six says she slept with her brother-in-law while both were still married and now her sister isn’t speaking to her. Now that’s fame. Frances McDormand on Meatloaf and PruneAnother Gabrielle Hamilton loyalist. Gabrielle Hamilton Hits the Big Time As ‘Page Six’ Says She’sWith her sister’s husband! She’s really getting famous now! The Perennial Plate Dazzles at Prune’The Perennial Plate’ feeds Prune loyalists. Does Prune Contain New York’s Worst Table?And do we smell the backlash beginning? 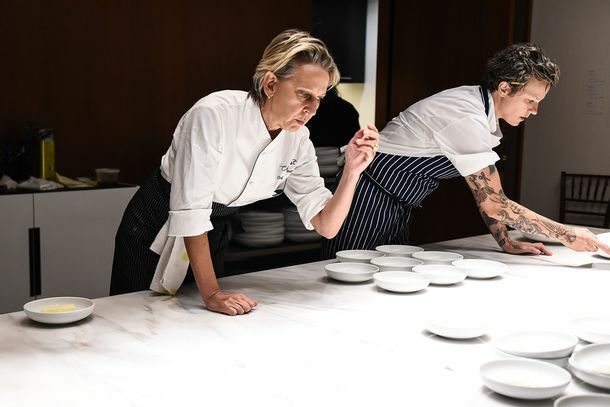 Prune Wasn’t for FoodiesGabrielle Hamilton tells Leonard Lopate why her restaurant struck a chord with chefs. Kraft Invites You to Flavor Your Water; Sunday-Brunch Insanity at PrunePlus: certain Teflon cooking methods safer than others, Domino’s adds boneless wings, and more, in our morning news roundup. Gabrielle Hamilton Has a Date With Anthony BourdainPlus, Valentine’s at Prune. Lawsuit Brewing For Le Cordon Bleu Pasadena; Mario Batali Is Sued AgainThe red-maned celeb chef is sued for a third time over alleged employee exploitation, while L.A.’s division of the famous French cooking school is accused of making false promises. Ice-Cream Parlor Uses Liquid Nitrogen; Prune Turns TenPlus: A new party at the Rusty Knot, and green drinks in Queens, in our regular roundup of neighborhood food news. East Village Feasts: Prune, Hearth, and Momofuku Introduce Irresistible SpecialsFried chicken, pig roasts, and old favorites. Skål! Prune Serves Scandinavian SuppersGet ready for trifle and medaljer! Prune Celebrates Valentine’s AND President’s DayA closer look at Gabrielle Hamilton’s V-Day extravaganza. Citeralla Explains Tongue-on-Tongue ActionThe Freemans chef says he wasn’t aware of Prune’s similar tongue-and-octopus dish.